The Cherokee Heritage Center is a non-profit historical society and museum founded in 1962 to preserve the historical and cultural artifacts, language, and traditional crafts of the Cherokee. The Heritage Center is located on the site of the original Cherokee Female Seminary, which burned in 1887. Today three columns of that original building remain on the site, beside the museum. Inside, the building houses the Cherokee National Museum which features a permanent Trail of Tears exhibit, as well as many temporary exhibits throughout the year, including two major art shows each year. Outside, the grounds are home to the Diligwa Village and Adams Corner. The Diligwa Village was opened in 1967 but fully redesigned and rebuilt in 2013 and portrays Cherokee village life in the 1700s. 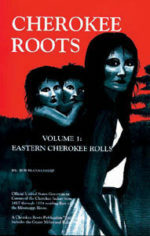 It features many Cherokee crafts people who demonstrate traditional basket weaving, blowguns, flintknapping, and more. Adams Corner illustrates Cherokee life from the 1890s, the period just before the end of Indian Territory and Oklahoma statehood. Open Monday through Saturday 9 a.m. to 5 p.m. during the summer, and Tuesday through Saturday 9 a.m. to 5 p.m during the winter. Closed on Sundays, January 1-16, Thanksgiving Day, and December 23-26. Admission to the museum is $8.50 for adults, $5.00 for children over 5, and $7.50 for seniors and students. On the first Saturday of each month federally-recognized Cherokee citizens and a guest receive free admission. Directions: The Cherokee Heritage Museum is just outside of Tahlequah in Park Hill, to the southeast. Follow the signs to the site. For specific directions, click the “Directions” link in the location bubble of the map above and enter your starting location on the left.